An attempt to visit Paracale's Pulang Daga Beach, named after the red colored sand beach (daga means soil in Bicolano), did not materialized due to Tutubi's friend's insistence to have lunch in an island that's so near the "gold rush" town of Paracale. It turned out it's on the list of Tutubi's islands he wanted to visit: Maculabo Island, just to verify claims of some people (and bloggers) that it's like this famous island teeming with tourists down south. The trip to Maculabo Island is just a mere thirty minutes from the Paracale Port via motorized banca, an hour more, you'll find yourself in the mesmerizing Mahabang Buhangin of Tinaga Island, Calaguas Islands. Both Tinaga Island and Maculabo islands are part of the Calaguas Group of Islands though Tinaga Island is politically part of Vinzons, Camarines Norte. Pictures of Maculabo Island, the white sand beach of Centro (or Sentro) as the locals call the place. The white sand beach boasts white sand alright but it's not as white nor as fine as the sand of Mahabang Buhangin, (erroneously called Calaguas Island). Centro of Maculabo is inhabited with a small barangay (village) where Tutubi's friend bought freshly-caught fish (talakitok and tanigue). Romblon has beautiful white sand beaches, too. 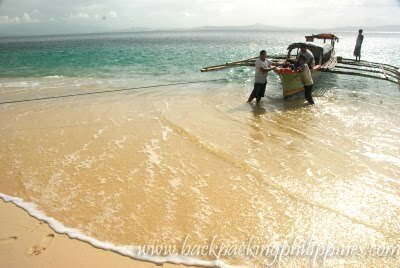 Have you taken a visit at Romblon? so envious of your white sand beach. looks very pristine beach! 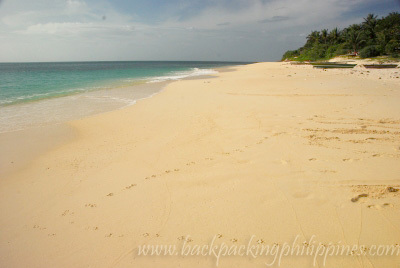 the sand looks boracay-quality or perhaps better. i miss the beaches back home; batu ferrhingi here in penang doesn't come close to any shoreline in pinas. wow! What a perfect place to enjoy summer vacation. The place looks very refreshing and relaxing. Enjoyed reading about Maculabo Island and I like the pictures you selected. Hi tutubi! can you please tell me how to get there from manila. Im from Gensan and i love to travel different beaches a lot. please thank you.